If hitchhiking isn’t your thing and you haven’t hired or bought a car for your travels through New Zealand, then bussing it is the next best option. The two most used companies are InterCity and Naked Bus, both which offer cheaper fares the earlier you book. There are also the tourist tour buses, such as the Stray Bus or Kiwi Experience or Magic Bus (see Nomadic Matt’s post for more info), often filled with backpackers looking to meet up with other. 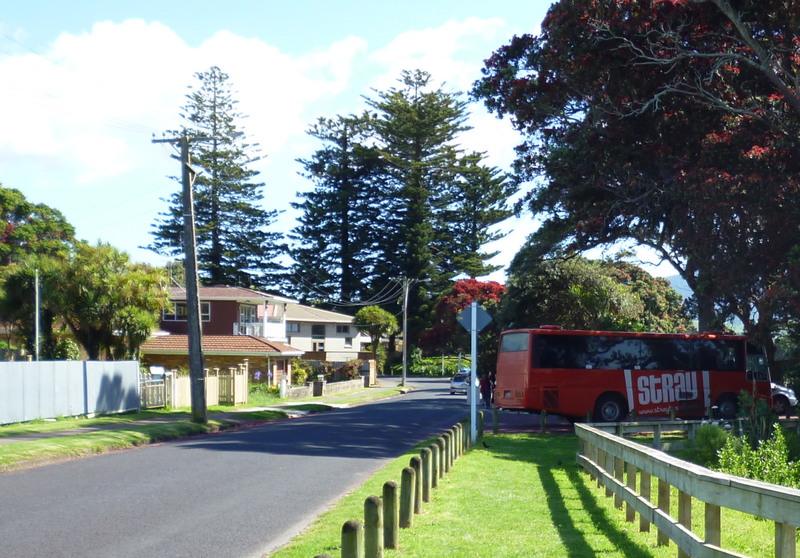 In Raglan I met a local who called the Stray Bus the Shag Bus because ‘all these eighteen year olds step off and straight away you see them eyeing each other up’. Make of that what you will. Despite a really good sales pitch from the guy in NOMADS hostel in Auckland who insisted that I should Stray it because ‘it’s a good way to meet people if you’re travelling alone’ and ‘see places that the normal buses just don’t go to’, I wanted to keep it cheaper and more local. And I wanted to do some hitching. The Airbus ($16 one way) leaves from outside both International and Domestic terminals every ten minutes (between 7:00pm and 7:00am less regularly). An option to keep it cheaper that may be worth exploring is taking a bus from Auckland Airport to Manukau City ($4) and then a bus from Manukau City to Britomart (approx. $4) which is pretty much where the Airbus drops you off in any case. It’s a slower journey but will cost half as much. Intercity trip lasting approximately 2 hours and costing $19. Bus leaves from SkyCity in Auckland. Can buy tickets online or at Sky City. This Intercity trip was in two stages: Hamilton-Manukau City, Auckland (1 ½ hours, $16) and Manukau City – Auckland Airport (40 minutes, $4). Bus from Anglesea Street bus stop out the side of the Hamilton Transport Centre. My first NakedBus trip booked a couple of days in advance costing $44 for the 6 ½ hour journey. Broken into two stages: Whangerei – Auckland (2 ½ hours) and Auckland – Rotorua (4 hours) with a brief stop in Hamilton. Bus from “The Hub” Transport centre at the Town Basin on Dent Street. Booked one day in advance, this 5 hour NakedBus journey went back via Hamilton and cost $44. Ipicked up the bus from Fenton Street, near the corner of Arawa Street in Rotorua. This NakedBus trip took six hours and cost $34 when booked one week in advance. Bus pick up is opposite the New Plymouth Travel Centre on Ariki Street. A few additional things: They’re quite strict about seat belt usage in New Zealand with the threat of hefty fines if you’re caught without by plain clothed policemen. With InterCity and especially NakedBus, buy tickets as far in advance as possible. With both it is possible to pick up fares from $1. Some NakedBus buses have free WiFi, although its not always very reliable.